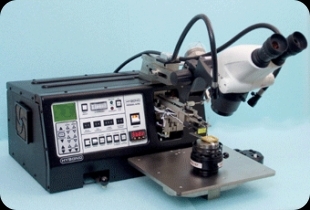 Model 626 is a Deep Access, Long Reach Wire Bonder that can operate as a Ball, Wedge, Bump or Peg bonder. The 626 can be used for wire diameters from 0.7 to 2.0 mil (18 to 51µm) gold wire when in ball bonder configuration or 0.5 to 3.0 mil (12 to 76µm) and ribbon up to 1.0 x 12.0 mil (25 x 300µm) when in wedge or Peg bonding mode. The 626 was specifically designed for applications that require bonding at extreme height differences between 1st and 2nd bond and for bonding wires to sensitive devices such as gallium arsenide FET's and LED's. Model 626's motorized wire feed and wire/ribbon clamping system provide superior wire/ribbon control and allow the operator to increase or decrease tail length in 1 mil (25µm) increments at a touch of a switch. 626 shows actual units for set up of bond parameters. Change over from Ball bonder to Wedge bonder requires only a press of a button to turn EFO power to zero and a change from capillary to wedge tool. 626 can also operate in Bump or Peg bonding modes. Add OP-47 for pick, place and bond feature. Electronic ball size control 0-4x wire dia. Up to 1 x 20 mils (25,4 x 510 µm) in wedge bonder mode. 70 lbs / 150 lbs (31,8 / 68,2 Kg). Shipping weight will vary. Copyright © 2019, Hybond Inc.